Hindi is the official language of India. It became the official language in 1949, and since then it is the language used in the governmental sector, as well as it is taught in all schools as a language. It is spoken by most of the people in India. One of the best ways to learn Hindi quickly is to be exposed to it, interacting with Hindi speaking people is one way to be exposed to it, this is called language immersion. Another way to be exposed to Hindi is through technology and the use of apps. Speak Hindi: This app will teach you all the basics, commonly used Hindi phrases are taught, and the app says that in just 5 minutes a day you can learn Hindi. This is a learn Hindi quickly app There are hundreds of basic and commonly words. There are also lessons in Hindi grammar. There are also conversations between Hindi speakers, to help you learn the proper pronunciation. This app also has an option to listen to you pronounce and speak Hindi. You will get positive feedback if you are speaking clearly. There is also a section that focuses on verb conjunctions, to make sure that you are connecting your sentences properly. In Hindi there are masculine and feminine verbs that do not exist in the English language. This fact makes the whole sentence structure and words that would be used different depending on the “gender” of the verbs and nouns. As the app states in the title, this app helps you to learn Hindi quickly! There is a lot of audio-visual content to help you master Hindi, it also teaches you correct Hindi grammar. This app also has flashcards and quizzes, to help you track your progress. More than 1100 words in this app are categorized into 33 categories, including but not limited to: Food, feelings, friendship, and work related words. This app is free, which is great because a lot of apps out there charge you to learn. After working with this app for a few months, it will help you gain the confidence you need to start speaking with others. With such a vast number of words available, once you have the basics down it is easy to understand where to fill in the newly learned verbs and nouns to fit into various conversational applications. This app is geared more towards children’s learning. There are drawings and colorful pictures and letters, to appeal to children’s imagination. This app teaches children how to connect consonants and vowels. This is a learn Hindi quickly app, There are images of dotted letters for children to trace. After tracing the letters the images can be saved to the phone’s photo gallery. Numbers 1-10 are also taught on this app. This app teaches the Hindi alphabet, numbers, and Hindi grammar. This is one of the best app to learn Hindi quickly. This app has a daily Hindi word and Hindi sentence, to help you become familiar with new Hindi words. This app contains quizzes and translation practice. This app works with you so that you don’t spend time memorizing words that won’t help you work toward your goal. This app has an impressive word count of 6000 words, which can help you ultimately speak like a native if the words are learned and sentence structure is learned. There are multi-section levels available, and the sections can be purchased separate, so you do not have to move on or advance until you feel ready. The language has been divided in 15 main topics and 140 subtopics, that relate to any type of conversation. This app is also divided into three skill levels, that applies to beginners, intermediate and advanced language learners. This is another app geared towards children of all ages, from toddlers to preschoolers and kindergartners. This is one of the best app to learn Hindi quickly. This app teaches the Hindi alphabet, and you can click into it to hear the proper pronunciation of the words. This app is colorful and designed to keep children’s interest. This app features a flashcard dictionary, and spaced repetitions. Also once the app is downloaded it does not require an internet connection to access it. This is really appealing for road trips, your child can access the app on a tablet, regardless if internet is available or not. This app is 100% free for beginner and advanced learners, and is workable for children and adult learners. This app includes 10,000 flashcards. It also an accelerated part of the app, that allows you to work ahead. This app contains over 300 phrases that are commonly used for new speakers. The developers of this app are based in India, and are native Hindi speakers. The easily accessible phrasebook, can help you to easily navigate around India, or a Hindi speaking population, without trouble. There are quizzes that help you to track your learning progress. This app also teaches numbers and how to say the time in Hindi, this is a really great thing to learn. The first step in learning any language is to learn the alphabet, once you learn the alphabet and letter sounds it will enable you to recognize what letters make up different words. This is a good supplementary app for beginners and advanced learners. Learning doesn’t feel like learning, because it is organized into a game. 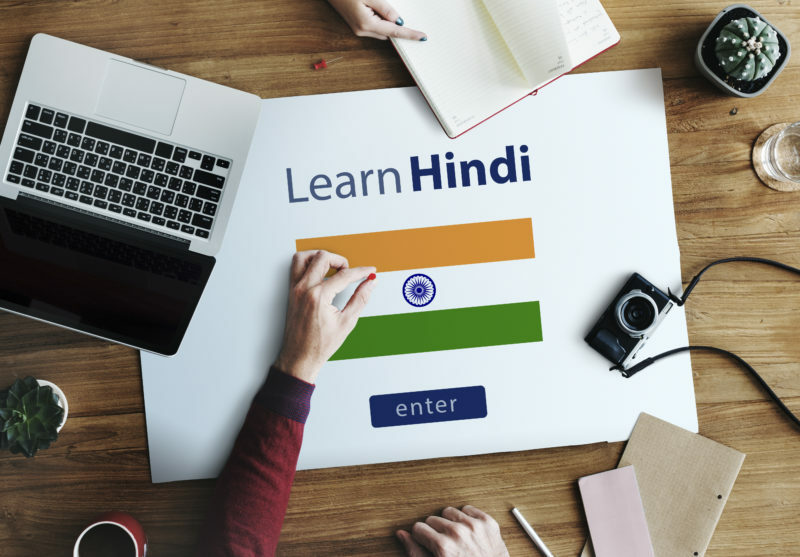 Any app you chose will help you get closer to your goal of learning Hindi, learning another language is a real asset, not only in your work life, but in your personal life. Learning Hindi opens you up to build relationships with people that may otherwise be inaccessible because of a language barrier. Hindi is one of the world’s most spoken languages, with over 340 million people speaking it worldwide. Learning a new language can help you open doors that would otherwise be closed. There are Indian people in all corners of the globe, Indian people have a rich cultural heritage which includes their language, food and clothing. We encourage you to visit an Indian store, whether it is a clothing store or grocery store to engage in the beauty and the wonder that is Indian. Also it can be a good opportunity to try and practice your newly learned Hindi language.